Somewhere between the tremolo-riffing of Immortal and the power chords of classic thrash, with an eye on the stars and the terrible Satanic entities that dwell therein, Columbian/American duo Inquisition have been blasting out discordant hymns for nearly thirty years now. Remarkably, despite owning a sound that is both instantly recognisable to black metal fans and little changed over their career, the band haven’t stagnated or become entrenched in a self-dug ditch. Bloodshed… is an album both old and new, sounding classic and of 2016 simultaneously. It’s black metal to the core, both earthy and otherworldly, blasting percussion and serpentine complexity of riffs, melodious and hypnotic yet heavy and constantly moving, a snake endlessly coiling and uncoiling. The few issues on which I’ve had reservations about the band in the past, thanks mainly to the frog-like croaks that the vocals could very easily be mistaken for, seems utterly nullified. Not only are the vocals a truly sinister rasp here, they’re not at all the focus of the songs. Instead, the guitars take the lead, a magnificent glorification of riffs, textural drones, melodic twirls, even chugs that swoop and swirl around your head like shooting stars. At times they’re downright progressive in feel, like the uneasy variations on the title track, from post-black to drone and even some guitar hero-esque lead. Elsewhere, they chug and grind straightforwardly, an arrow to the heart, almost catchy in moments like Power from the Centre of the Cosmic Black Spiral, a track that virtually a has chorus with those repeated vocal invocations. Consistently, though, as on Wings of Anu, they form a brutal wall of complex noise, crushing you over and over again, capably backed by the rhythmic drums of Incubus. Tempos change frequently, but the mid-paced chugging of A Black Aeon Shall Cleanse is as compelling as the crawling The Flames of Infinite Blackness Before Creation or the faster parts of Mystical Blood. The songwriting is, as ever, superb. Touches like the acoustic outro to Through the Divine Spirit of Satan a Glorious Universe is Known work well, and although there are two actual outro pieces the first of these, Outro: The Invocation of the Absolute, the All, the Satan is genuinely creepy, like some Hammer Horror-esque ritual. As for Coda: Hymn to the Cosmic Zenith, well, it’s hard to resent the band for indulging themselves a little when we have so much good black metal filling the rest of the album’s near-hour-long running time. 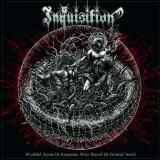 Inquisition have outdone themselves here, a terrific album.